That's right, the film that scared the pants off 90s children is making a return to cinemas, and based off the names associated to the remake, it's going to terrify a whole new generation into some sleepless nights. 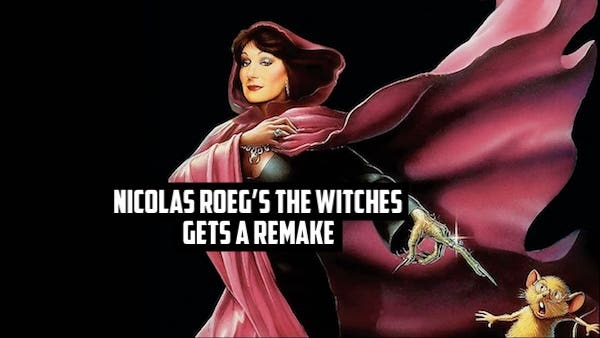 To those who are unfamiliar, the 1990 Nicolas Roeg directed film was based on the 1983 Roald Dahl book of the same name and tells the story of a boy and his grandmother, who discover a plot by the Grand High Witch (played by Angelica Houston) to destroy all the children in England. Ripe with grotesque visuals and seething with darkness under its fairy tale surface, it holds a 100% on Rotten Tomatoes, and absolutely destroyed me as a kid. I never thought I'd see The Witches return to the big screen, but Robert Zemeckis (Back to the Future, Who Framed Roger Rabbit?) is in final negotiations to direct the Warner Bros.’ remake, which also boasts Alfonso Cuaron and Guillermo del Toro as producers. Zemeckis is also slated to write the script, with his partner Jack Rapke producing through their banner ImageMovers. Del Toro had previously been attached to direct, but a scheduling conflict led the 2017 Oscar winner to abandon the director’s chair. Although the film is perfectly within del Toro's wheelhouse, it's comforting to know that he's still lovingly attached to the project to oversee its development. And the film is in the comfortable hands of Zemekis, who has crafted some of the most iconic films of all time, and will likely be making big waves again with his forthcoming film Welcome to Marwen, starring Steve Carell, which he also wrote and directed. One thing's for sure: it's time to get scared all over again. I, for one, cannot wait. What do you think? Did The Witches haunt your childhood? Are you excited to see it return? We want to know. Share your thoughts and feelings in the comments section below, and be sure to stay in the Viddy Well loop...because an untied knot is just a string! Robocop Returns With Blomkamp Behind The Wheel! Who's Says The Blind Can't Direct? !